Scale Free Network (SFN) is an art-science collaborative and micro-publisher founded in 2007 by conceptual artist Briony Barr and microbial ecologist Dr Gregory Crocetti. 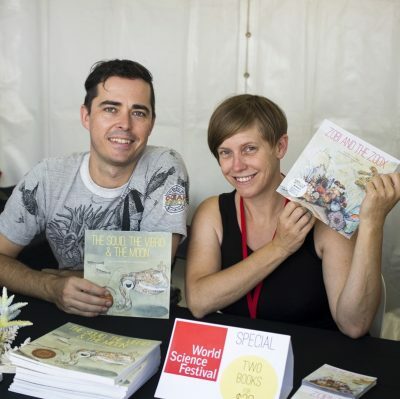 Based in Melbourne, SFN creates interdisciplinary workshops, installations, artworks, picture books, graphic novels and educational resources, inspired by the microscopic world. Publishing stories with microbes as the central characters makes us pretty darned niche! Even though plants and animals only make up one percent of the biodiversity on the planet, not many other people seem to be creating stories about the other 99%. We also co-create each of the books we publish, working alongside writer Ailsa Wild and artists Aviva Reed and Ben Hutchings, in consultation with many different scientists. One of the main inspirations for our stories is microbial symbiosis (partnerships between microbes, like bacteria, and larger forms of life) and we like to think of our collaborative process as being very symbiotic, between the different members of the team and between the disciplines of art and science. Also, all three of our publications would not have been completed without the support of crowdfunding campaigns—another example of the power of collaboration! At this stage, we’re releasing about one title each year. We have published two titles in our ‘Small Friends Books’ series—The Squid, the Vibrio and the Moon and Zobi and the Zoox in 2014 and 2015, respectively—with the first of our graphic novels, The Invisible War, released in mid-2016. What have been your biggest successes in Australia? Our first picture book The Squid, the Vibrio and the Moon has sold the most copies of our titles to date, which at nearly 4000 we’re quite proud of, considering we don’t have a marketing budget. Our graphic novel has received much wider acclaim—and is fast catching up with sales. Accolades for The Invisible War include being nominated by the Children’s Book Council of Australia as a ‘Notable Book of 2017’, winning two Australian Educational Publishing Awards, winning the Best Designed Educational Primary/Secondary Book 2017 (Australian Book Design Awards) and being shortlisted for a 2017 Most Underrated Book Award and a 2017 Ledger Award for excellence in Australian comics. Which of your titles do you think would be best suited to overseas readers? Well, microbes are everywhere … so we believe all of our titles can potentially target readers in every country! We would love to see our ‘Small Friends Books’ series published overseas, and given the emerging trend towards narrative nonfiction children’s books, we’re confident that these picture books have strong international appeal. While our graphic novel includes a few specific Australian WWI history themes, the rich science throughout the book is universal to all human microbiomes. As such, The Invisible War is a resource suited to high-school science classrooms everywhere. As testament to this claim, the Australian Educational Publishing Award judges recently described The Invisible War as ‘a revolutionary approach to cross-curricular learning’. We are currently deep into the research and development of two new stories in the ‘Small Friends Books’ series—both set in the soil. We have also been working on a plan to co-publish the series with a larger Australian partner. A second graphic novel is also on the cards and—like The Invisible War—will involve a part of the human body as setting, and a historic as well as scientific theme.